Apple today unveiled Beats headphones in fresh color options that are designed to match the newly announced iPhone XS and iPhone XR models. 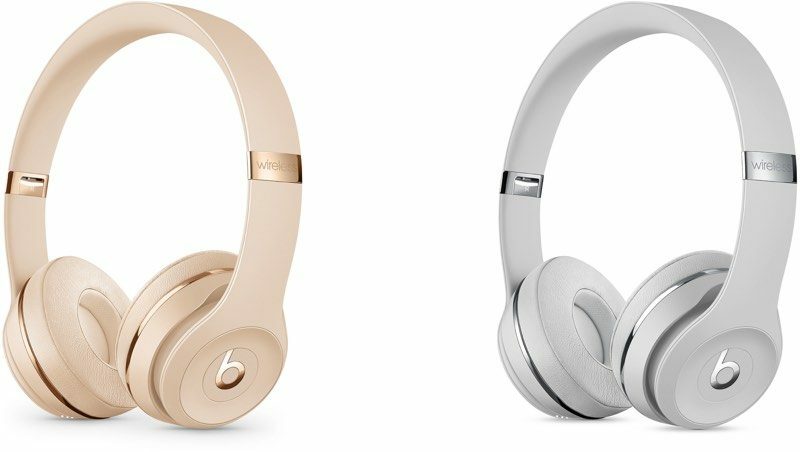 The Beats Solo3 Wireless On-Ear headphones, priced at $299.95, are available in Satin Silver and Satin Gold, two new shades that match the silver and gold iPhone XS models. There is no Space Gray option. The UrBeats3 Earphones with Lightning connector, priced at $59.95, are available in new Blue, Yellow, and Coral colorways to match the iPhone XR models that come in those shades. While the new Solo3 Wireless models are available for purchase starting today, the UrBeats3 models that match the new iPhone XR will be available later this fall, presumably when the iPhone XR models are released in October. Why do these still use a MicroUSB cable to charge? I disagree. They should be Lightning. With the W1 chip and all, they're clearly targeting iPhone users with these. That makes little business sense at all. Why forgo potential sales to make a small segment of their customer base "brand happy"? Yes, these colors are targeted at iPhone users. iPhone users who have proven time and again they will buy the Beats regardless of the charging connector. This was true before the acquisition and it continues to be true today. Tech geeks and tech journos care about charging connectors. The general public just wants to avoid inconvenience. Possibly having to buy a lightning adapter would be an inconvenience. An unnecessary one. They're used to mUSB. If ain't broke, don't go trying to fix it. It ain't broke. This model was originally released in 2016. These are just new colorways. They were released at the same time as the BeatsX, which charge using a Lightning cable. Then why do the BeatsX use a Lightning cable to charge? Which as I said above were released around the same time. Wouldn't the same logic about forgoing potential sales apply there? Why didn't it? If nothing else, Apple should be consistent. Ubiquity. Worldwide ubiquity. USB-C hasn't penetrated enough of the market yet to warrant a change. Lighting would dampen sales from a larger segment of Beats purchasers. The W1 chip isn't specific to Apple products. These headphones will work very well with all bluetooth devices. Still no active noise cancellation??? ?